Gary Samuel Cuozzo was born April 26, 1941 in Montclair. He grew up in Glen Ridge. A legendary student-athlete (Gary would go on to Phi Beta Kappa honors in college), he lettered in football, basketball and track, winning state titles in discus and shot put in 1959. He received All-State recognition on the hardwood and gridiron in his senior year, leading both teams to state championships. For the football team, it was back-to-back titles, 1957 and 1958. Gary was widely recruited and accepted a scholarship to the University of Virginia. He was not an overwhelming physical specimen, standing 6'1" and around 175 pounds, but he knew how to run an offense, and rarely took risks with his passes. The Cavaliers were a dismal, winless team when he arrived on campus. Gary lettered in all three of his varsity seasons, and during his junior and senior seasons, Gary led the team to respectability under coach Bill Elias. Even so, no NFL or AFL club was wiling to gamble a draft pick on Gary in 1963. 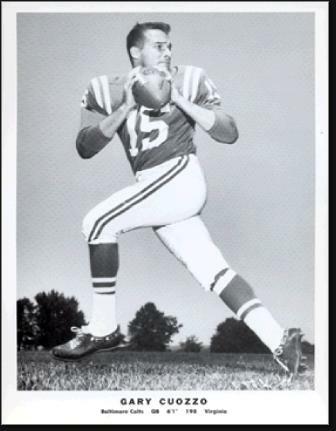 The Baltimore Colts happened to be in the market for a backup quarterback, however, and Gary made the team as a benchwarmer behind Johnny Unitas. Gary saw action in 14 games over the next two seasons, throwing a grand total of 53 passes. 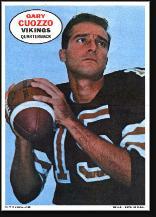 The 1964 team made it to the NFL Championship game, but lost to the Browns 27–0. It looked like more of the same in 1965, as the Colts caught fire in October and November, winning six straight games. But then Unitas went down with a back injury. After two-plus years of apprenticeship, Gary was finally inserted into the starting lineup for the first time. He started against the vaunted Minnesota Vikings pass rush...and threw five touchdown strikes in a 41–21 victory. A couple of games later, Gary separated his shoulder and was out for the year. Halfback Tom Matte took over play-calling duties and almost guided the Colts back to the championship game. After spending the 1966 campaign on the bench once again, Gary asked the Colts to trade him. They found a willing partner in the expansion New Orleans Saints, who needed an experienced quarterback. They traded center Bill Curry and a draft choice that the Colts turned into Bubba Smith. Gary played one year in New Orleans, starting 10 games and finishing with 1,562 yards and 7 touchdowns. Billy Kilmer eventually won the everyday job and Gary was dealt to the Minnesota Vikings. Gary played the next four NFL seasons with Minnesota, first as a backup to Joe Kapp and later as the starter. In 1969, the Vikings won the final official NFL Championship game, before losing to the Chiefs in the Super Bowl. Gary actually saw a few downs of action in Super Bowl IV, completing one pass in three attempts and throwing an interception. Gary played his final NFL season with the St. Louis Cardinals, as a backup to Jim Hart. For his career, Gary completed 584 of 1,182 pass attempts for 7,402 yards with 43 touchdowns and 55 interceptions. He played for some of the best and worst teams of his era, and was a first-rate backup who did whatever he could to help his team win. He also had the distinction of making the cover of Sports Illustrated (with the Saints) and The Sporting News (with the Vikings). After football, Gary returned to New Jersey, to the Monmouth County town of Middletown, with his wife, Peggy, and their four kids and opened an orthodontic practice in. He had been studying dentistry at the University of Tennessee during the NFL off-seasons and graduated at the top of his class. Gary kept the game ball from his five-touchdown day in his waiting room. In 1990, his eldest son, Gary Jr. was killed during a drug deal. Gary devoted himself to lecturing against the dangers of drugs. In 1997, another son, Patrick, joined his father in his dental practice.